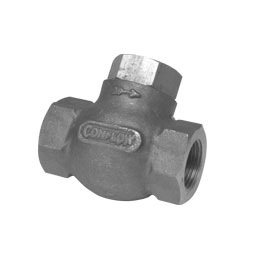 The Conflow Code 11 - Check Valve is fitted into pipelines on systems where the flow of fluid is required in one direction only. The design is such that only the weight of the valve component needs to be overcome in the direction of fluid flow and hence the resistance across the unit is small. If system requirements necessitate the valve to be fitted vertically, then a light spring can be added. The valve is suitable for both hydraulic and pneumatic systems and is designed especially for silent operation on equipment with pulsating or reverberating action (e.g. air compressors). 1/2", 1", 2", 3" & 4" sizes available. Larger sized valves used in conjunction with Code 18. 1/2" to 2" sizes Brass construction, 2" to 4" sizes Steel construction.